I used lemm and ny00123's modid (and GIMP) to convert it to an egagraph, as TED5's egamode seems to have been more tested by ID. Aryan_Wolf has made some Episode 4-6 tiles for it too if anyone is interested in a 6-episode compatible version. P.S. Alt-O can be used to change maps. You might also try EMM386 or QEMM. I never got EMS running in my DOS days, so I can't tell you the pros and cons of these two programs. @Chris Yay, you got the Tile16s to show properly!!! Great job, man! I'm really happy we could get this to work! Wow this is great! Now i wonder about what sprite editor they used, since it seems they used the same one for Doom. It is not known (yet? ) whether the final egagraph.wl6 used for TED5 had floors closer to the images above or below. I doubt it seriously, as such graphics would've been in ESWAP.WL6 instead. Wolf3D was moved to VGA pretty early on. I'd honestly be surprised if 8-directional sprites of the guards ever existed for EGA. 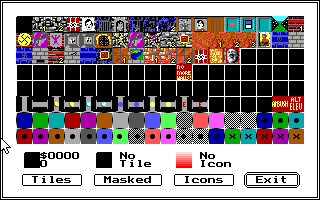 Odds are that Id got fed up with the 16-color limitations long before the Shareware sprites even had a complete set ... with or without enemy sprites. When searching for "egagraph.wl6" in quotes in google I found 0 results though... so I'm guessing the elusive egafiles with the final TILE16s used for wolf3d were never released publicly or slipped out yet. NY00123 theorized that maybe the TILE16s seen in the vgagraph (found in the beta) were only added specifically into the game for F10-O, which I think makes the most sense now. For the remainder of the EGAGRAPH files, certainly. It was probably easy to hack up the EGAGRAPH files from Commander Keen and begin work on an EGA version of Wolf3D. Creating an ESWAP file from scratch to run an EGA-compatible version ... I guarantee that takes a little more time and effort. For the record, WDC can work with the Tile16s as well. Pressing 1 or 2 will control which planes you draw on when you left click the mouse, or do some other operation. Left Mouse Button Draw current selected tiles to currently selected planes. Clicking on the tiles in the lower left corner will bring up a selection box for that plane. lower right. Enter to copy it into buffer. Esc to stop process. F Flood-fill one plane's tiles with currently selected tile. U Undo last action. This is occasionally erratic. Be careful! Carmacized Maps will play in Wolf3d v1.1+, but you have to use MTEMP.TMP as the maphead file (the other one is for maptemp). 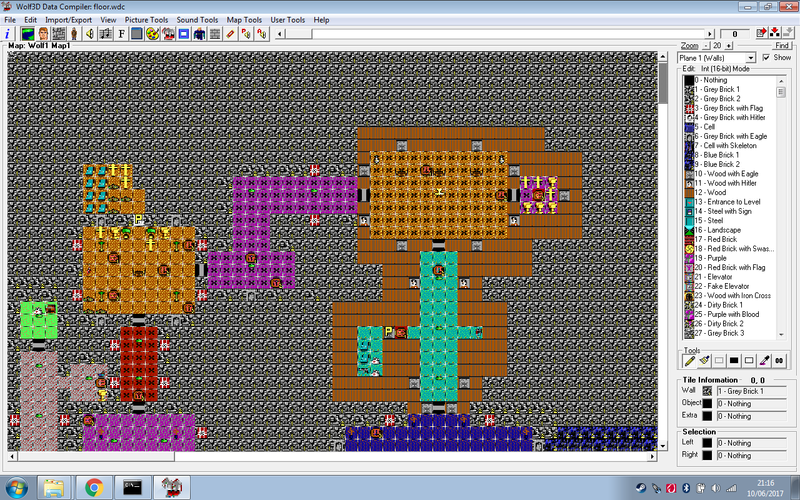 This one also has Aryan_Wolf's Episode 4-6 wall tiles, the floor colors, and a 19x11 test map. 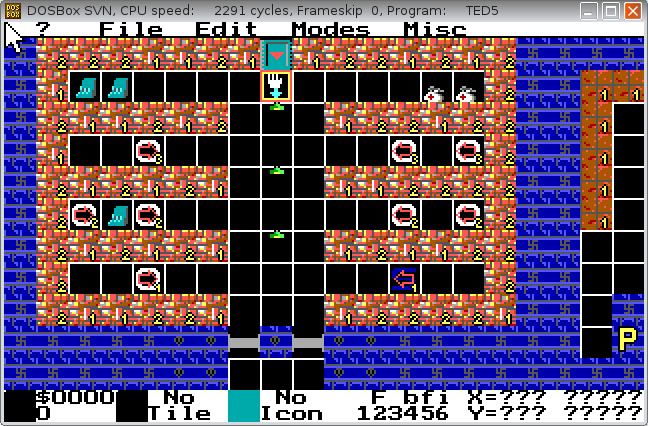 In order to get the vga tiles to look right, I had to take a screenshot of the "garble", feed it back in, take another screenshot (this time they were sideways), feed it back in, take another screenshot, and use that 3rd garble to get the correct image. 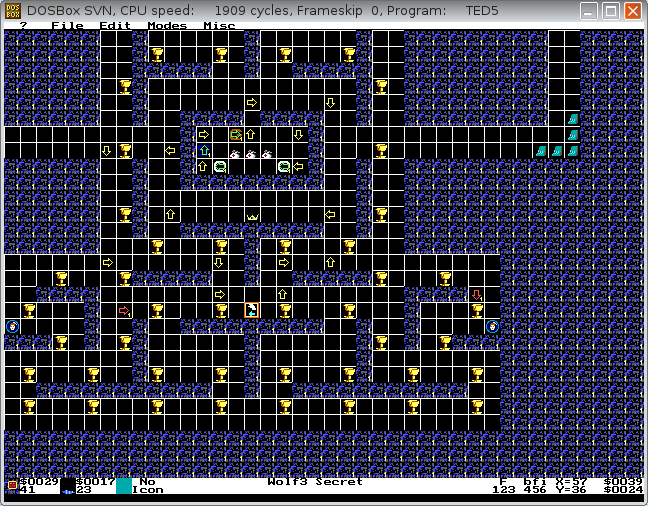 I kept only the secret levels this time as interesting examples, and so that the Carmack compression would be faster. The create map option works, as long as you do delete map on that slot first. You just have give it a name then type 64 and 64 for the width and height to begin. I didn't edit the object plane (it's still the one from the beta), so you have to guess which tiles are for the Episode 4-6 bosses (I just remember they're near the Episode 1-3 ones ). edit: I updated the link in the first post with this version too. It's more fun with the strange vgamode quirks! Haha. Though seriously, we do need a permanent solution... eventually. 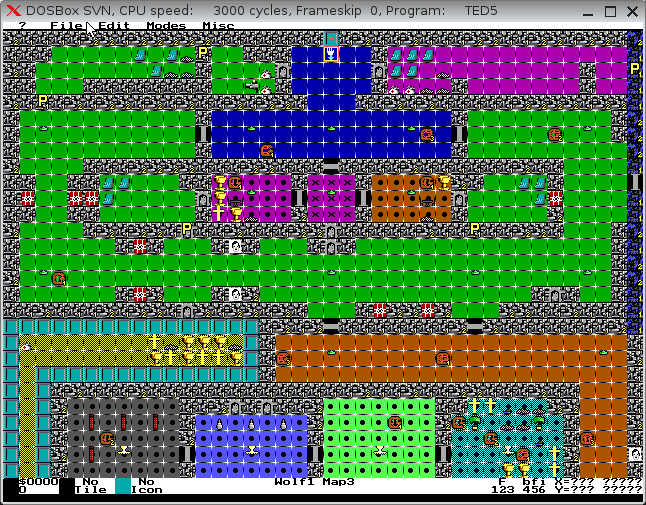 Also, in case anybody's wondering, it is possible to get TED5 to recognize CGA graphics! For my experiments, I used Keen CGA Apogee v1.4. Note that its CGAGRAPH.CK4 structure is a little bit different: It has 1 less font (no star wars scrolling text) and one more bitmap (dunno why). Luckily, though, the tiles have the exact same offsets as in EGAGRAPH.CK4, meaning that you may copy-and-paste GFXINFOE.CK4 to GFXINFOC.CK4 (although fixes unknown to me might still be required). - Get a TED5 setup ready for Keen 4 map editing. There's probably something out there ready for you. Alternatively, you can use TEDSETUP.EXE, but you'll first have to unpack KEEN4E.EXE. - Since this'll actually work (albeit it might be a lil. bit of cheating), copy GFXINFOE.CK4 to GFXINFOC.CK4. - Extract CGAHEAD.CK4 and CGADICT.CK4 from the unpacked EXE. The offset of CGAHEAD.CK4, which is 14256 bytes long, is 0x1EA30+0x2C00 (in the unpacked KEEN4C.EXE). The offset of CGADICT.CK4 (1024 bytes long) is 0x3375C+0x2C00. - Hopefully you can get TED5 to work with these graphics! - If TED5 finds CGA and EGA files, you'll be asked to choose between CGAGRAPH.CK4 and EGAGRAPH.CK4 on startup. - The Video Mode Switch (F9) will *not* work if there are just CGA graphics. If compatible CGAGRAPH and EGAGRAPH files are present, though, then TED5 will first change from CGA and EGA and then shuffle through the two familiar EGA modes. - All infoplane sprite graphics are empty. Furthermore, none of the foreground tiles is sparse. I suspect CGAGRAPH.CK4 was more-or-less created on the last minute before Keen 4 v1.0 was released, with virtually all work done with EGA in mind. - For another hint of this, know about Catacomb 3-D? Well, although unused, it still has CGA-specific code sections from Keen Dreams, including ID_VW_AC.ASM. As in Keen Dreams, though, VW_DrawPropString and ShiftPropChar do *not* take fontnumber into account (Keen Dreams has just a single font). This had to be fixed for Keen 4, of course, but it (very) possibly happened during the last week preceding the release of Keen 4 v1.0. Update: I added an IGRAB subfolder to the zip in the first post, so that you can recreate an egagraph.wl6 for Tile16s the same way ID did in DOS. Thanks to Nexion for showing me how to get igrab working with the wolf.i script (just type grab.bat). 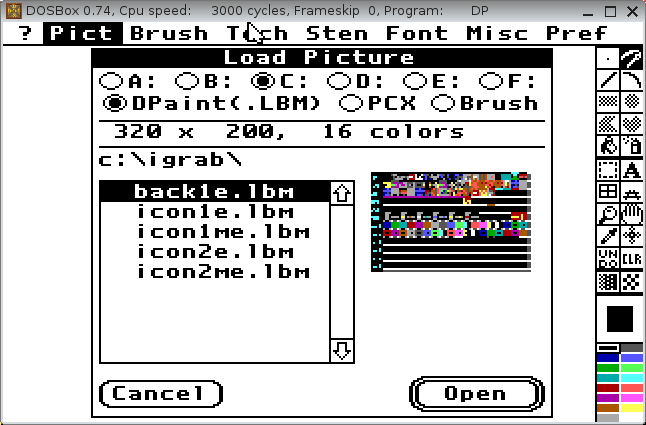 To open and edit the LBM files themselves, I used Deluxe Paint II Enhanced 3.0. Just make sure to open it in EGA mode (320x200 seems best for most things to me) or it might not save your edited LBM files in a way IGRAB understands. I also had to edit the dosbox-0.74.conf to something like sensitivity=2 so that my trackpad wouldn't move too fast in Dosbox. edit: Also added the doorwalls, garble walls, fake elevator, and moch ammo (in v1.4 only) to the selectable options. Is there a 'Manual' for TED5?